Want to bring innovation into the kitchen? Take part in the biggest student challenge in the kitchen world! Boasting professional opportunities, prizes, creative immersion, a two-day final and a visit to Groupe SEB, the world leader in small home appliances invites you to take part in this exceptional adventure! Whatever your background, submit your ideas and cook up a storm in this major challenge! A range of prizes up for grabs! Smartbox "Tables étoilées et tables d'excellence"
Each team member will receive a culinary trip worth €800! A feast for all your senses! Each team member will receive a €400 culinary discovery weekend that's full of surprises! Each team member will win a day worth up to €300 at Alain Ducasse's culinary school! Sweet or savoury, there's something to suit everyone's taste! Each team member will win a Smartbox "Tables étoilées et tables d'excellence" gourmet restaurant gift experience worth €149.90! Each team member will win a Smartbox "Tables de Chef" restaurant gift experience worth €99.90! a central role in our well-being! Look at the kitchen from a new angle! Every year, the kitchen and cooking market sees all sorts of new arrivals. New ingredients, new appliances, new smart devices... There are so many new innovations in this sector. Got your own innovative kitchen ideas? Imagine a new appliance, a new product, a new service or any other kind of project to get the best out of your kitchen! To eat well, you have to keep an eye on what you're eating. The food we prepare should give us everything we need to stay in shape and feel well. Imagine new solutions for tasty, wholesome and well-balanced meals – solutions like the Actifry fryer, which lets you cook food with just a single spoonful of oil. Over to you to create a project that helps consumers to help themselves, while making mealtimes a shared moment for everyone to enjoy! AMake sure not to sacrifice the enjoyment that comes with food – after all, it's a key part of well-being! The arrival of smart devices has disrupted our habits. What's the next step? 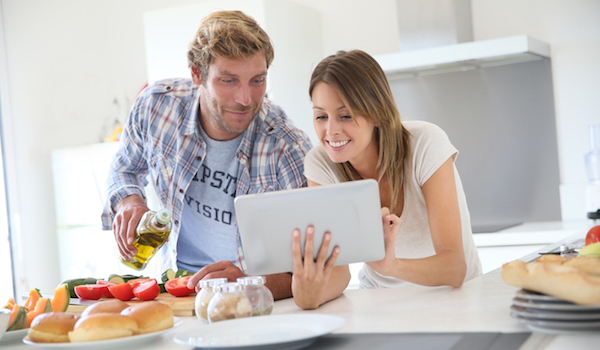 What new role will the kitchen and smart devices play in our lives? Perhaps you've heard of Cookeo, the smart connected multi-cooker. Why not imagine your own project that brings a new dimension to cooking? New smart devices and new interactions between them, smart kitchens, energy savings, new consumer habits and more... Anything is possible! Look to the future and imagine the role of the kitchen and kitchen appliances in tomorrow's world! Submit a relevant project that answers the following questions. How will it help consumers on a daily basis? What's the value of your project? How can your project reach your target market? What market are you targeting? What's the project's USP? What will the costs be? The benefits? Remember that your project must be feasible and accessible. Keep consumers, their expectations and their behaviour in mind. How do they currently cook? What do they want to see in their kitchen? What do they need in order to eat a balanced diet and keep an eye on their well-being? What are the dietary challenges of tomorrow? What are their habits and lifestyles like? Ask yourself all these questions to find the best solution! Ready for two days at Groupe SEB? After the first step, the chosen teams will be invited to spend 2 days at Groupe SEB's headquarters for a chance to win the challenge! Present your concept at the Marketplace organised at Groupe SEB headquarters. Work with your team to create and run a project presentation stand and introduce your project to the Groupe SEB jury and to company employees. 5 teams will be selected for the final! Workshops and a chance to learn about Groupe SEB will be available to teams that aren't selected – the ideal way to continue the experience and discover what goes on behind the scenes! The 5 shortlisted teams will take part in a creative immersion experience with Groupe SEB employees. It's the perfect time to develop your ideas! Time for presentations to the final jury – and your chance to win the challenge! The Groupe SEB Academy 2016 finalists will present their projects at a Marketplace at Group SEB headquarters in Ecully, near Lyon, France!